The inspiration for this came from a large project where the contractor created several headaches for himself and for us because he was building from an old set of drawings. 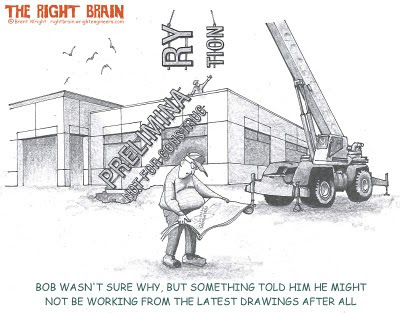 When this cartoon originally appeared in January 2006 Wright e-news I called the cartoon contractor Terry (coincidence?) instead of Bob.